For the first time in Brussels, new comedy sensation Tez Ilyas! Tez Ilyas feels like he’s constantly on trial. It’s time to teztify against all the assumptions the world has of him. Armed with his trademark cheek and uncompromising approach, don’t miss this slick, smart and typically subversive show. Star of BBC Radio 4’s TEZ Talks, BBC Two’s Live from the BBC and BBC Three’s Man Like Mobeen. ‘Ilyas has a slickness more reminiscent of US comics, and the gags to back it up’ (Guardian). ‘Radiantly entertaining’ ** (Times). ‘A vital discussion of some of the most difficult issues facing this country’ ** (Telegraph). 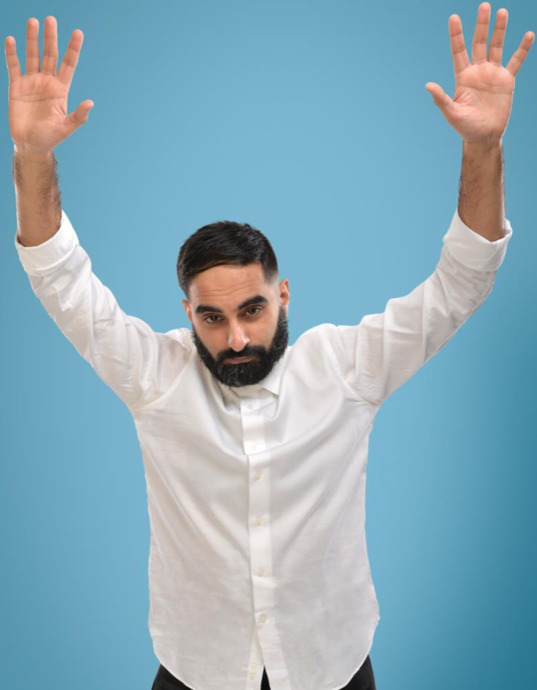 Tez Ilyas the ground running finding himself in no less than eight competition finals including the prestigious BBC New Comedy Award and Leicester Mercury New Comedian of the Year in his first year as a stand up. In 2015 Ilyas achieved phenomenal success with his debut stand up hour TEZ Talks. A sell out run at the Soho Theatre and his own Radio 4 series based on the show followed, with a second series coming this year. In 2016, his highly anticipated follow up show Made in Britain went on to sell out every single performance (including extra shows) at the Edinburgh Fringe and gained spectacular critical acclaim, with a smash hit nationwide tour in 2017.His third show Teztify once again delivered a spectacularly powerful, provocative and brilliantly funny hour of topical stand up, delivering to packed out audiences night after night. Tez has appeared on The Last Leg (C4), Mock the Week (BBC Two), Live From the BBC (BBC Two), Man Like Mobeen (BBC Three), Kevin Hart’s Live from Montreal (LOL Network), Virtually Famous (E4), The Now Show (BBC Radio 4) and made a brand new quiz show pilot for Vice. He has also written and starred in his own scripted comedy shorts for BBC Three, BBC iPlayer and Sky Arts.